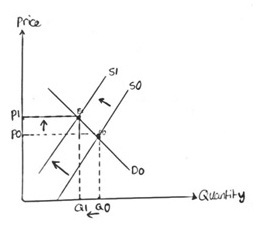 b) A shift to the lift in the supply curve means a decrease in the supply hence the price would shift up causing an increase from P0 to P1. 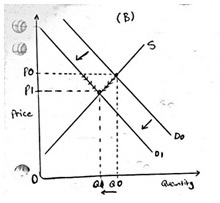 c) Price increase from P0 to P1 causes a decrease in the demand from Q0 to Q1. a) The supply stays the same at the same time a shift to the left causing the demand to decrease due to the schools holidays ending. 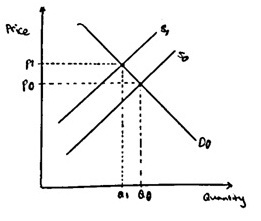 b) The equilibrium falls from P0 to P1 due to a left shift in the demand for the interstate flights and the supply remains the same. 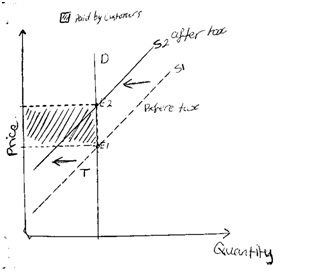 a) A shift to the left in the supply curve causing the supply to decrease. b) As ford is in need for oil to run hence it’s a component good it demands for additional goods falls. b) It’s a normative statement hence it can’t be determined if it’s true or false but on the other hand additional tax on cigarettes prices is a way of collecting tax revenue for the government. Under the trade model with external economies of scale, is it possible for a country to be worse off with trade than it would have been without trade? Justify your answer. Standards "drive instruction," therefore, how do standards influence curriculum planning? When comparing monopolization to monopolistic competition in the wireless telecommunications world, what are some good differences to touch on in a short paper? What effect does the teacher have on creating a learning environment with little to no behavior problems? Briefly explain what separations are, how do they effect the average duration of unemployment?